I seem to always be experimenting with different ingredients and flavour combinations, and my latest creative success is this buckwheat and berry crumble. I have made many crumbles in my time but never with buckwheat flour so decided to give it a go. I've teamed this buckwheat crumble topping with fresh strawberries, blackberries, and a sprinkling of fresh mint. The tartness of the berries and freshness of the mint play nicely with the nutty, earthiness of the buckwheat and hazelnuts. The combination is delightful! I like to serve it warm with fresh organic cream, but you could also serve it with yogurt or a dairy free alternative like coconut yogurt. Side note: I am also very excited about a recent product discovery I made... Vanilla Bean Powder! I discovered Loving Earth Vanilla Bean Powder at my local health food shop not long ago, and am already obsessed! It is pure organic vanilla bean pods ground into a powder. I often use vanilla bean paste in cooking, but found some brands contain additives like sugar syrups or even alcohol. If you don’t want to use whole vanilla bean pods or paste this is a great alternative. The vanilla powder comes in an airtight amber jar, so it's easy to keep stored in the pantry. My little jar is lasting forever! It's very economical. I highly recommend. Slice the strawberries and mix them in a bowl with the blackberries, rice malt syrup, vanilla, a few fresh mint leaves and set aside. 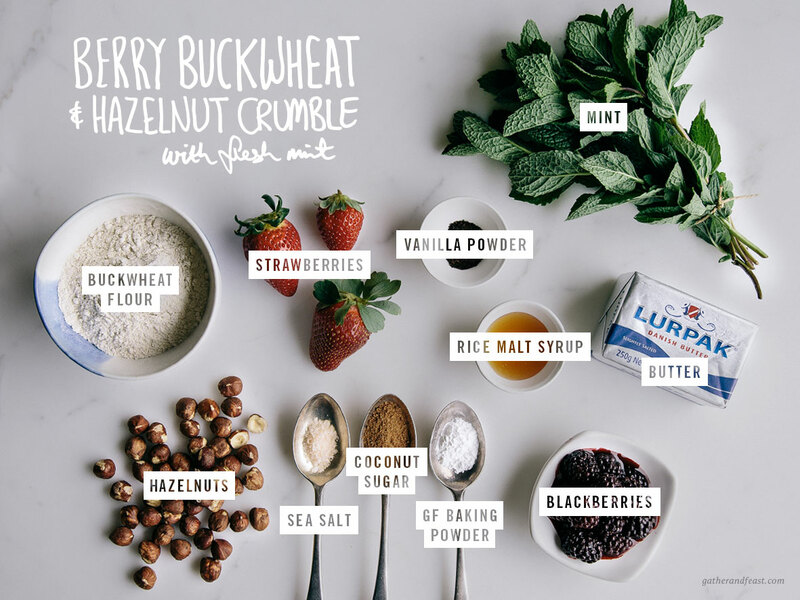 Mix the buckwheat flour in a bowl with the coconut sugar, vanilla, sea salt and rice malt syrup. Add the chopped butter into the flour mixture and mix in with your fingertips to create a crumbly texture. Add the chopped hazelnuts to the mixture and stir to combine. Place the berry mix into a baking dish then sprinkle the crumble mixture on top. Pop the dish into your pre-heated oven and bake for 30 minutes. Once cooked, take the crumble from the oven and let it cool for 5 minutes. Serve with freshly torn mint leaves and fresh cream. For this week’s recipe I thought I’d combine a few of the things I LOVE about spring into one dish. This Spiced Date & Caramel Vegan Self Saucing Pudding is vegan and refined sugar free, yet still super delicious!